Malaysians are becoming increasingly health-conscious these days. We automatically ask for ‘kurang manis’ when ordering our favorite teh tarik and restaurants that promote healthy eating are getting more popular than ever. But for those who seldom eat out and prefer to cook at home regularly, do you know that the type of cooking oil you use plays a huge role in your diet? Choosing a good cooking oil is important because it provides the body with healthy fats that are essential to our well being. So the next time you are shopping for cooking oil, look out for NeuVida Omega-9 cooking oil. It is available in all leading supermarkets and health stores. NewVida’s official website is at http://neuvida.com.my. NeuVida is a world class cooking oil produced from Nexera seeds, a variety of super grade non-GMO sunflower and canola seeds. It has a clean light flavor that does not affect the natural flavors of other ingredients that it comes into contact with. More Omega-9 than olive oil. 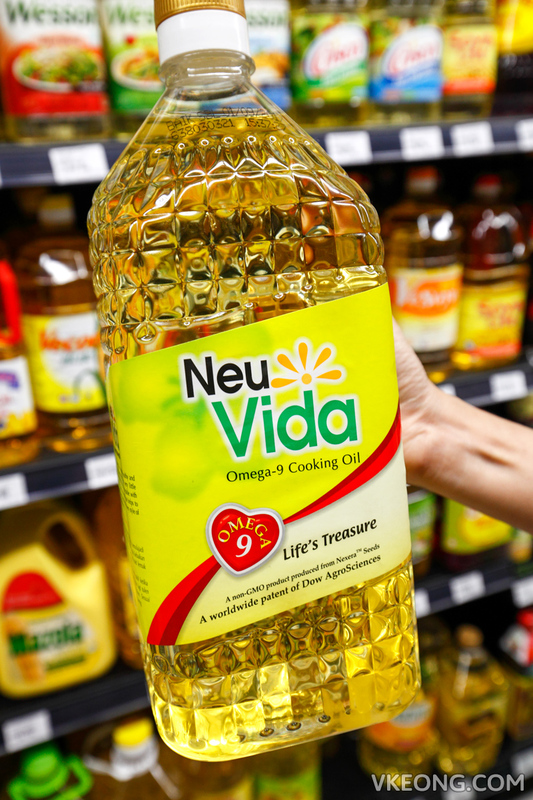 NeuVida cooking oil is extremely rich in Omega-9 goodness (82%), in fact even more when compared to olive oil (72%). Research has shown that Omega-9 fatty acids helps to lower LDL (bad) cholesterol, raise HDL (good) cholesterol and control the blood sugar levels in our body. In simpler words, it helps to reduce risks of cardiovascular disease and stroke. The smoke point of a cooking oil is the temperature at which the oil starts to break down, produce visible smoke and ceases to be useful. So the higher the smoke point a cooking oil has, the more versatile it is and the more cooking methods you can use it for. NeuVida is heat stable even at temperature of 250°C which makes it an ideal all purpose cooking oil suitable for drizzling over salad, deep-frying, stir fry and sauteing. Besides having zero trans fat, NeuVida Omega-9 cooking oil also has the lowest saturated fat among all edible oils. It has 8% of total fatty acids, almost half of olive oil’s 14%. With its low saturated fat level, excellent balance of polyunsaturated and monounsaturated fats, NeuVida Omega-9 cooking oil is a healthy source of fat in your healthy balanced diet. Cooking with NeuVida Omega-9 Cooking Oil. Here’s a simple steak dinner recipe with NeuVida Omega-9 cooking oil. Affordable steak cuts (Australian beef) can be purchased at Village Grocer and my favorite choices are sirloin and ribeye. They typically cost between RM20 to RM23 a cut weighing around 250g. 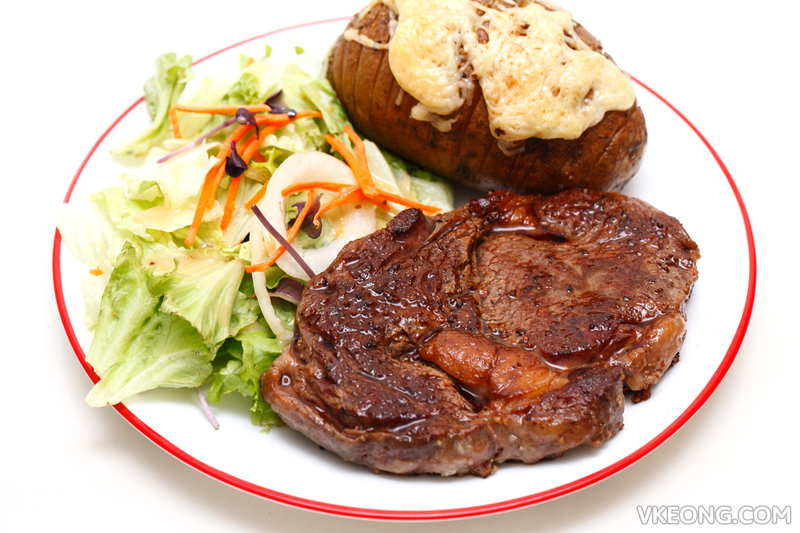 A complete meal accompanied with baked potato and salad will not cost you more than RM25 a serving. If you cook it right, the steak will taste like restaurant-standard and you won’t need to fork out big money to enjoy a delicious steak anymore. 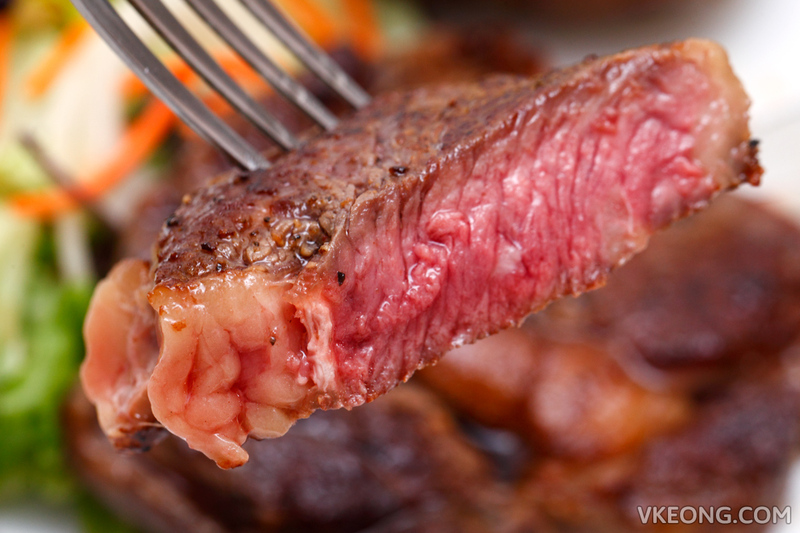 Let steak sit on the counter for 20-30 minutes to bring to room temperature. This will let the meat more evenly from edge to center. While waiting, prepare the salad dressing by mixing 3 tbsp of NeuVida Omega-9 cooking oil, 1 tbsp of vinegar, a pinch of salt and black pepper into a bowl. Whisk until they come together. Add dressing to salad, toss and arrange on a serving plate. Preheat the oven to 230°C. Stir the butter, 1 tbsp of NeuVida Omega-9 cooking oil, salt and pepper in a small bowl. Slice the potato into thin slices, leaving the bottom unsliced. Brush the oil mixture and make sure you get in between all the slices. Bake uncovered until tender and crisp on the outside, 25 to 30 minutes. 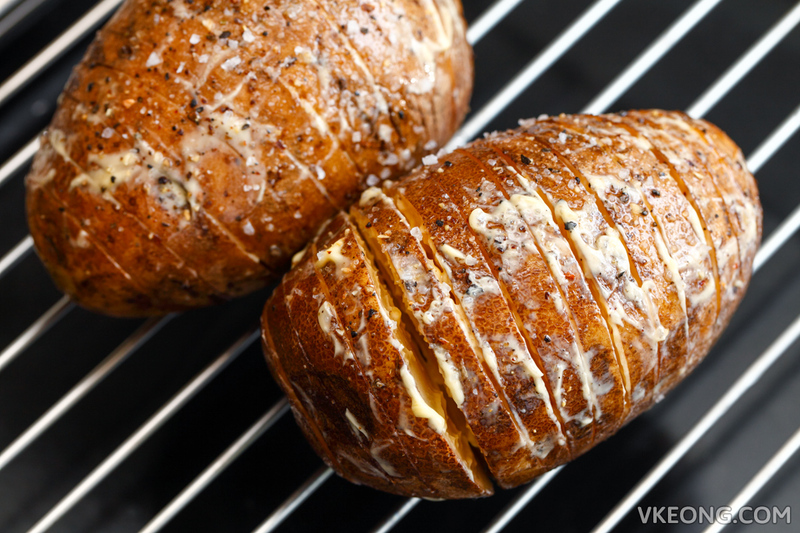 Shred parmesan cheese and spred over the potatoes and continue to bake for another 5 minutes. Sprinkle salt, pepper and garlic powder evenly over the steak. Heat a non-stick pan over high heat and add 2 tbsp of NeuVida Omega-9 cooking oil. Swirl the oil around to coat the pan evenly. Add steak to pan, cook 1 minute on each side or until browned. Reduce heat to medium-low and add butter. Tilt the pan towards you and baste the steak with the pool of butter constantly. Cook an extra 1.5 minutes on each side. 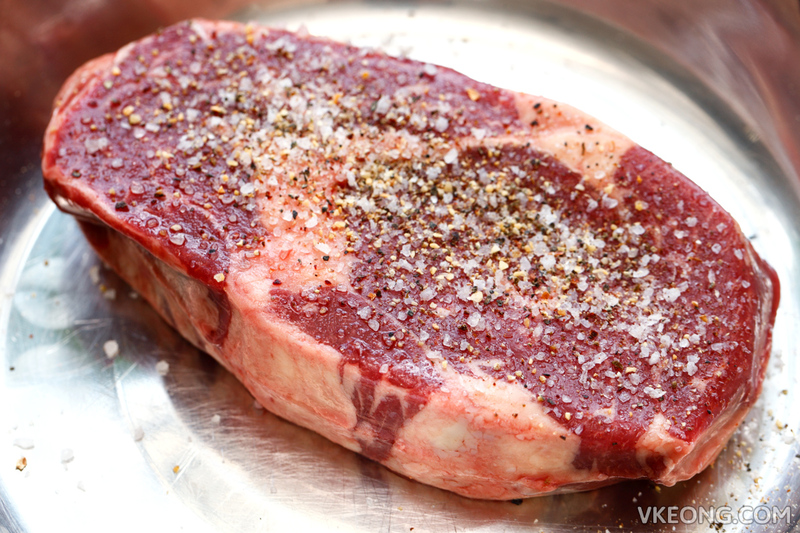 Remove steak from pan and let it rest for at least 5 minutes. Do not cut the steak while it’s resting or it will lose all the juiciness. Remove the baked potato and steak and plate them next to the sald. Serve immediately. The meat should be medium rare as shown above. The post NeuVida Omega-9 Cooking Oil, a World Class Healthy Cooking Oil appeared first on Malaysia Food & Travel Blog.